Welcome to the new Harmar Soccer Club Website. Links are in Orange! If you can't find something you are looking for, make sure to check the links in the green navigation bar or email the Webmaster. 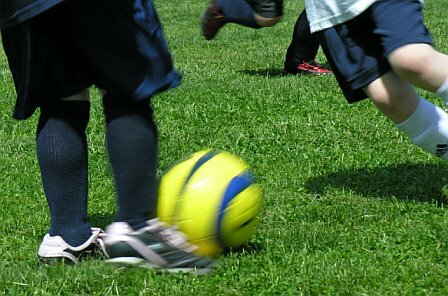 Saturday June 9th is the last day of Spring Soccer for U6 and U8. U8 Round Robin begins at 9:00 am with trophy ceremony approx at 10:45. U6 games will be played at 11:00 am with their trophy ceremony to follow. Download the form today or attend Open Registration on June 11, 2007 from 6:00 - 8:00 PM. Discount registration of $20 before June 11th. Registration closes June 25th! Hurry! Your children will enjoy this summer camp - for ages 4 - 14! They will learn skills and tactics, defense, goal scoring, dribbling and more! Visit their website or download the registration form here. Did you know that the club will cover the costs for all coaching courses that you take up to the 'D' level. Visit the PAWest's Coaching Development pages. Now's the time to register for the D License or D License upgrade being offered this June in Monroeville. For more info about these and all the courses currently on the schedule visit the Coaching Calendar, visit PA West Coaches School Website. If you're interested in becoming a referee, now's the time to check the PAWest Referee Calendar for the Entry Level course near you. The calendar is updated daily...check it out. This is also a good course for coaches who want to learn more about the game. Did you know Harmar Soccer T-shirts are for sale at the Snack Bar? Show your support for your club and your team. Great for gifts for your entire family- get 'em this Saturday and wear them to the next game. Do you have digital photos from recent Harmar Soccer events? Email them to the Webmaster and she will upload them to the Photo Gallery. The Harmar Soccer Club is a volunteer non-profit organization that is dedicated to enriching the lives of the youths of our community through the sport of soccer. We represent the communities of Springdale, Cheswick, Springdale Township, Harmar Township and the surrounding area. Our goal is to provide a learning environment which promotes sportsmanship, teamwork, athleticism and physical fitness with an emphasis on having fun!